Hotel Miami Beach Resort, Miami Beach, United States of America - Lowest Rate Guaranteed! With a stay at Miami Beach Resort in Miami Beach (Mid Beach), you'll be a 3-minute drive from Miami Beach Boardwalk and 9 minutes from Miami Beach Convention Center. 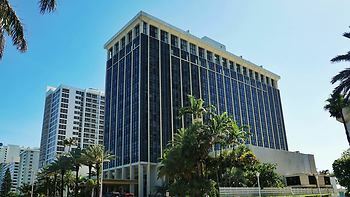 This beach resort is 2.7 mi (4.3 km) from Collins Avenue Shopping Area and 3.1 mi (4.9 km) from Lincoln Road Mall. Lots of closet space, nice partial view, nice entrance, attentive valet service. Uncomfortable pillows, air conditioning too high in public areas.